"The future belongs to walkable communities," claimed planning scholar Reid Ewing at a forum in Burlington, Vermont, sponsored by the University of Vermont Transportation Research Center and the Chittenden County Regional Planning Commission and Metropolitan Planning Organization. Ewing, who recently joined the faculty at the University of Utah's City and Metropolitan Planning program, has long focused his research and writing on land use and transportation issues. 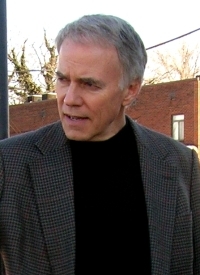 His career's included stints as Director of the Voorhees Transportation Center at Rutgers University and as a research professor at the National Center for Smart Growth. Interestingly, he's also squeezed in two terms in the Arizona state legislature. In his Burlington remarks, Ewing highlighted the benefits of "transit-oriented development" (TOD). But Ewing also argued that "pedestrian-oriented development has more potential nationwide than transit-oriented development." As he explained, outside of larger cities there's just not enough population to support rail-based transit, an essential component to TOD. That's certainly the case in places like Vermont. But pedestrian-oriented development (POD) will work in small and mid-sized communities. 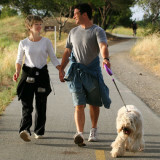 Ewing noted that walking is the second most used mode of transportation after the automobile. In the U.S. today, he said, 86% of all trips are by car, followed by 9% on foot, and only 2% by transit. What's more, when people are surveyed they invariably indicate they would like to be able to walk more. Yet land development patterns and current housing choices, Ewing argued, often put roadblocks in the way of increased walking. One factor necessary for POD, said Ewing, is density two to three times higher than the roughly 4 dwelling units per acre that is currently the norm in many suburbs. Also critically important is having a diversity of land uses close by. This allows, he noted, a higher proportion of people to walk from their homes to grocery stores, coffee shops, and sometimes, their place of employment. Another key factor in PODs or TODs is good design. Among the design principles Ewing pointed to is shorter blocks. "Block size is really important, and the shorter the block, the more walkable a community will be." As density increases it is also essential, he said, to provide ample public spaces, such as parks and plazas, "as a relief so it doesn't feel as crowded." Why care whether we have PODs and TODs? To Ewing, the single biggest benefit is that increased walking (or use of transit) reduces car use. 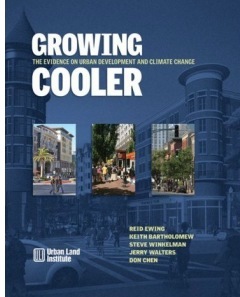 This matters because cars run on fossil fuels which emit carbon dioxide which increases global warming (Ewing is co-author of Growing Cooler: The Evidence on Urban Development and Climate Change, published by the Urban Land Institute). But walking, Ewing added, also yields health benefits. Ewing acknowledged that there's no hard data on the percentage of new development that would be considered pedestrian-oriented, though he said a ballpark figure would be between 3 and 5 percent. For Ewing, part of the problem is that "the development industry is still building for an outdated market, one that existed twenty years ago." Ewing does, however, see signs of change, especially in the increased consumer demand "for smaller lot single-family homes." Two other obstacles cited by Ewing: older land development codes which prohibit the higher densities and smaller lot sizes needed to support PODs or TODs, and "subsidies for automobile use" -- especially through what he said is the over generous supply of parking. 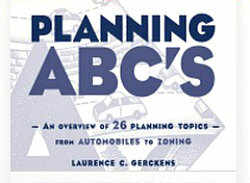 On this last point Ewing noted that "the less parking provided the more likely people will walk or use transit."